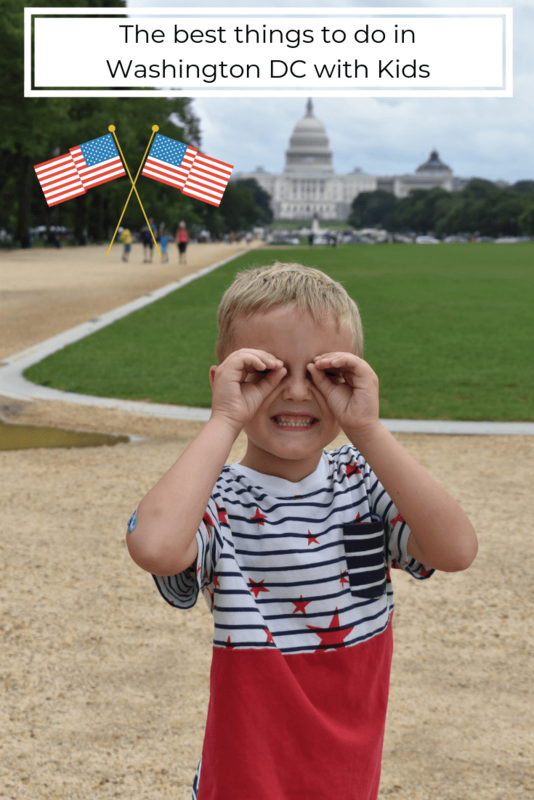 My six year old son and I just returned from his first trip to Washington DC. I did worry that he would be a bit bored visiting lots of museums and all of the history lessons that came with it, but we had such a great time and he can’t wait to go back. There is an endless list of museums to explore and the best part is that they are all free! As soon as we arrived, we threw our bags down in our hotel and began walking. We started at the Capital Building and walked down the National Mall to the Washington Monument. My son has been obsessed with this monument ever since he saw Spider-man. The monument is still closed for elevator repairs, which of course I explained that it was due to Spider-man’s big rescue so he totally understood. You can no longer get anywhere near the White House, so we just took a picture from a distance. Tours require a background check made two months in advance. It was a nice sunny day, so we sat by the World War II Memorial and dipped our feet in the water. From there, we walked along the Reflection Pool and up the stairs to the Lincoln Memorial, which is my personal favorite place in DC. Not only do I have mad love for Abe, but there are some of the best views of the mall from up there. Lastly, we strolled through the Vietnam Memorial before catching an Uber back to our hotel. This huge museum will impress kids and adults alike. The highlights for us were touching a real piece of moon rock and seeing the original 1903 Wright Flyer, which marked the advent of the aviation age. Standing in front of Amelia Earhart’s Lockheed Vega that she flew alone across the Atlantic Ocean, then flew nonstop across the United States-both firsts for a woman- was such an empowering experience. Just to think of the innovation and bravery that has gone into some of the feats that these people have accomplished is mind blowing. Just look at the Apollo lunar suit that still has moon dust on it- MOON DUST- and imagine what the person was thinking as they stepped out onto a different planet. It makes me realize how amazing humans beings are, and most importantly, I want my child to feel like he can do anything he sets his mind to. Ok, ok, this sounds dull and boring and nothing that would interest a 6 year old, but it was amazing. To walk past the original star spangled banner, all tattered and frayed, you could just imagine Francis Scott Key looking through the window of his ship the morning after the bombardment and scribbling down the words that would one day become our national anthem. The other highlight for us was seeing Abraham Lincoln’s top hat, which he was wearing at the time of his assassination and Thomas Jefferson’s desk where he wrote the first draft of the Declaration of Independence. These things made our country what it is today and to experience them first hand is not only very special, but such a great way for kids to learn about our history. My son loved the hands-on activities in the Spark!Lab where he learned about the process of invention. He also loved the America on the Move exhibit and playing in Wegmans Wonderplace, which is an interactive play space for kids aged 0-6. This is the only activity we actually had to pay for in Washington DC, but it was totally worth it. It is not meant for small children. Even my 6 year old was a little young for it, but it was his favorite part of the trip and at this very moment he is rehearsing his new spy name and cover identity. We had so much fun crawling through duct work and going on our own mission. It cost me $20 as an adult, children are $15 and kids 6 and under are free. Head straight for the rotunda to catch a glimpse of the Constitution, the Declaration of Independence and the Bill of Rights. These documents define our country, but whatever you do, don’t take pictures. Security caught a woman sneaking a picture on her phone and it wasn’t pretty! Wander around the hall of mammals and gaze up at the skeleton of a Tyrannosaurus Rex in awe of the amazing creatures that have roamed this earth. Kids will love the Discovery Room where they can get an up close look at fossils, petrified wood and other specimens and participate in some hands-on activities. These 25 minute tours will show you how paper is turned into currency. You can smell the fresh money from the streets! It was very interesting, but if you are short on time, cut this one out. It is a hassle because the ticket booth is in a different building (see map on picture below) and they only give out a certain amount of tickets per day. We got lucky and scored the last two for the day, but I dragged my son to three different places before we even found the ticket booth. We had such an amazing time. There is so much to see in Washington DC, plan for at least 3 days. We did more walking than we did at Disney World and the crowds were worse! Expect long lines getting into the museums, but they move quickly. There is airport-like security at each museum. Wear good walking shoes, bring rain gear so you don’t get drenched and make Uber your new best friend. Visiting Washington DC is such a great experience for children to learn about the history of our country. To read about where we stayed in Washington DC, click here!